I originally wrote this post for my contribution to RuralHousewives.com back in November, but never got around to posting it on this blog. Well, today is the day. It’s Pi Day! And what better excuse to honor this special “Once in a Century” Pi Day than with a special pie recipe! 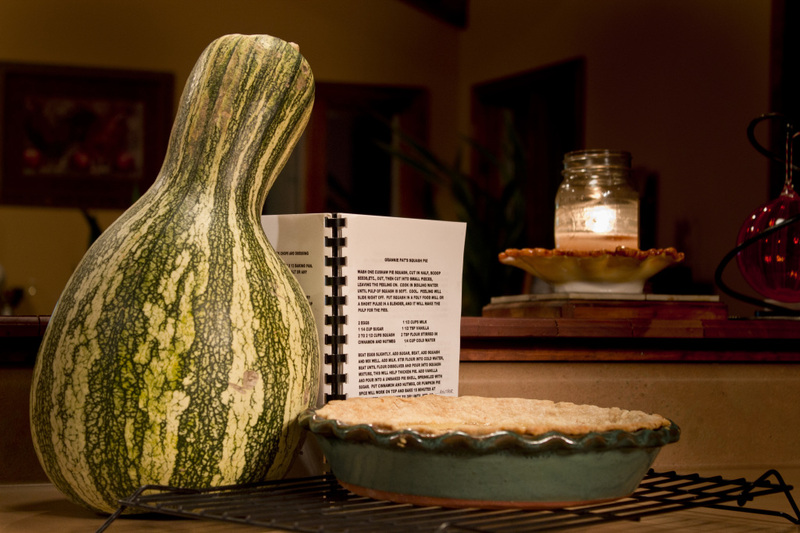 The star ingredient of this pie (which is very special to my family), cushaw squash, is grown in the fall. But you can stick this recipe in your recipe box and save it for when fall rolls back around! Hope you enjoy! NOVEMBER 11, 2014 — During the fall, the typical star ingredient is pumpkin. And there are pages upon pages of recipes for it. But as this Thanksgiving approaches, I wanted to feature a unique ingredient that is sure to win the rookie of the year award at your Thanksgiving table…squash! 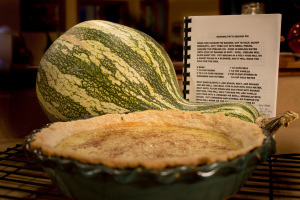 But this is not just any ole’ squash recipe, it is my family’s traditional Cushaw Squash Pie! “Squash pie? !” you might be asking. “That sounds awful!” Well let me tell you, it’s anything but awful! It could win over pumpkin pie any day in my book. To me, squash pies are a familiar family favorite and are the star of the show every Thanksgiving. But as I’ve gotten older it seems that few people know about them! As I started thinking about it even more, I realized that I hadn’t had much experience making them. That was always Grandma’s job! 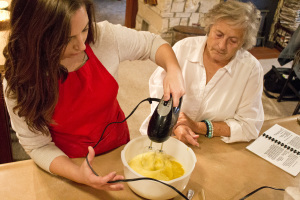 So when I was home this weekend I took the opportunity to spend some quality time with my wonderful grandparents and learn exactly how to make one of our favorite family recipes. And since this recipe is just SO incredibly good, I am going to share it with you too! Before we get started, I’ll give you a little more background on what cushaw squash actually is. The green-striped cushaw is a crookneck squash that typically weighs 10 to 20 pounds and grows to be 12 to 18 inches long. The skin is whitish-green with mottled green stripes and the flesh is light-yellow. It is mild and slightly sweet in flavor; meaty in texture and fibrous. It is sometimes called “cushaw pumpkin” and is often substituted for the standard, orange, jack-o-lantern pumpkin in pie-making. Cushaw is mainly grown in the southern and southwestern United States. It is a hardy plant, one that tolerates heat and resists the deadly vine borer; can be grown easily in vegetable gardens, and it can be stored for an unusually long time. 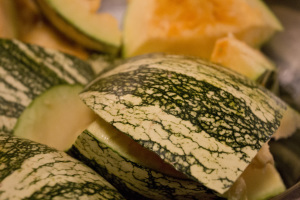 While the green-striped cushaw is not endangered per se, it tends to be grown in small batches for private use, and is not widely available in retail markets. Although widely known, the cushaw is a favorite ingredient in a few culinary cultures, including to some southwest Native Americans, to the southern Appalachians, and to the Louisiana Creoles and Italians. Making cushaw butter is a family tradition in Tennessee, and all around Appalachia cooks prefer to use cushaws in their pumpkin pies. 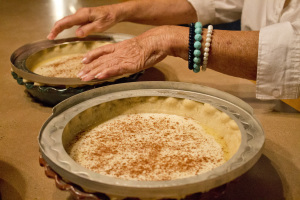 This squash pie recipe has been passed down from my great grandma, Mary Alice Griffin (“Grannie Griffin” as we refer to her), who grew up in Blackford, Kentucky. And according to my grandma Patsy, aka “Grannie Pat”, it may have even been passed down from Grannie Griffin’s mom, Florence. My mom and grandparents recently took a trip to Blackford to revisit some of the places grandma and great grandma grew up and it was incredibly fascinating to learn about! I wasn’t able to go, but my mom captured some wonderful pictures to keep as memories of the trip and our family’s history. As I was writing this, I remembered that today is Veteran’s Day. 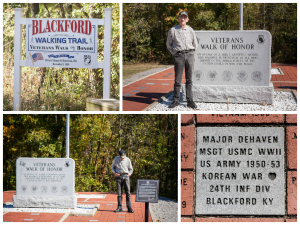 I wasn’t sure at first if I was going to be able to incorporate that into my post about squash, but as I was looking back through the pictures my mom took, I was reminded that Blackford, KY also has a wonderful Veteran’s memorial! That was the perfect sign that I couldn’t, and shouldn’t, go without recognizing its significance in my post. My grandpa Jim, or “Gramps” as I like to affectionately call him, was a veteran of the Korean War and was also along on the trip to Blackford. He enjoyed looking at the bricks in the memorial and even found one of my Grandma’s uncle, Major! Family and history have always been important to me, but I think I have come to appreciate them even more as I get older. And one thing I try to always remind myself is that our country is what it is today because of the people who have come before us and worked to build it. So today, this post goes out to the Veterans in my family as well as all of the brave men and women who have fought, and are still fighting, to keep our country safe. From the bottom of my heart I want to say, THANK YOU. This past Saturday I invited Grannie and Gramps over to my parents’ house and got a lesson in Squash Pie making – straight from the pro. My sister was there to help document the day with pictures, allowing me to fully concentrate on learning all the tips and tricks. And my dad, well, he was just there to be the taste tester. 🙂 It was such a fun afternoon! Alright, now let’s get down to business. The first step is to cook you squash. This can be a little bit of a process so be sure to plan in advance. I found a great tutorial on how to cook cushaw squash from The Novice Chef, but my Grannie Pat’s way of doing it seems even easier! Begin by washing one cushaw squash. Cut the neck of the squash off and cut into slices, (like the Novice Chef suggests). Then, cut the main part of the squash inhalf and scoop out the seeds like a pumpkin. Once that is done, cut the squash into large chunks. Here’s the difference in this technique – DON’T worry about peeling the squash before you cook it. And trust me, you’ll be glad you don’t have to worry about it because peeling a squash like this is a pain! Cook the squash in boiling water until the pulp of squash is soft. Let cool and the peel will slide right off. Once the peel has been removed and the squash is cool, place it in a food mill, food processor, or blender and puree until smooth. This creates the pulp for the pies. We store the pulp in Ziplock bags in the freezer. This can be kept up to three months or you can also can the squash to save for the whole year! We can it in chunks, not as a puree. Since we were going all out for this example, we decided to make homemade crust, but if you’re in a hurry, store bought pie crust will be fine as well. Grannie said that’s all she ever uses now days! 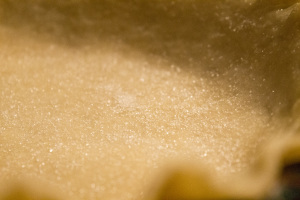 Grannie Pat Tip #1: Before putting your pie crust in the pan, rub some butter around in the bottom of the pan and it will prevent the crust from sticking to the bottom. Place your pie crust on your pie plate. Since we were rolling our dough out, we rolled the crust up on a rolling pin to help keep it in good form as we transferred it to the pan. Make sure to press your crust down around the entire bottom of sides and so you’re not short when you cut the excess crust off the edges. 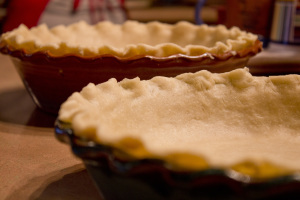 Once you have your pie crust positioned, cut the excess crust off around the edge of the pie plate. And I always like to add a decorative little fluted edge around my pies just for presentation. Before you start with the filling, remember to preheat your oven to 350 degrees. For the filling, start by breaking two eggs into a large mixing bowl and add 1 ½ cups of sugar. (The original recipe calls for 1 ¼, but Grannie Pat always adds extra.) Beat until smooth and then add in your squash pulp. Grannie Pat # 2: If you want to make great big thick pies, just double the recipe for the filling. Next add in the milk and vanilla. For this, Grannie says it doesn’t hurt if you put more than the recipe calls for so just eyeball it. In this case, I added about ¼ teaspoon more that the recipe says. Depending on your strength of vanilla extract, this can be increased or decreased. 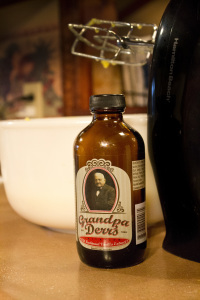 I was using our local town’s specialty, Grandpa Derr’s Vanilla Extract, which is a little bit stronger than most varieties so I didn’t add too much over. And finally, you’re going to add a thickening agent of flour and water, (also known as a roux). To do this, get a little bowl and put 2 Tbsp of flour into a ¼ cup of cold water. Sometimes she just guesses at it without really measuring. Keep mixing it with a fork until all of the flour is dissolved in the water. Grannie Pat Tip #3: The more of this you put in the faster it bakes and the thicker it gets. Grandma usually doubles it and decreases the baking time if she’s in a hurry. 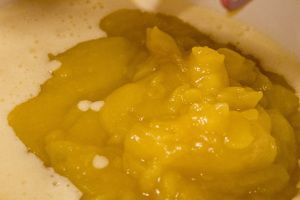 Once dissolved, add to mixture and beat a little more until combined. Before you pour the filling into the crust, I have one awesome little secret for you. This one comes straight from Grannie Griffin. 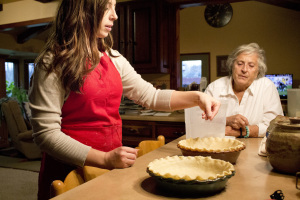 Her trick was to sprinkle the pie crust with some sugar before you pour anything in. Her reason, not sure. But why not? Then place in the oven for at least 45 minutes. Grannie Pat’s original recipe says to bake for 15 minutes at 425 and then reduce to 350 until set. But depending on your oven, you may want to just watch it to see what works best. And be sure to keep checking them to see if they shake. Once the pies are done, let them completely cool on a cooling rack before serving. This allows it to fully set up and obtain the consistency of the familiar pumpkin pie. This blog was longer than I normally write so if you’ve made it this far I want to thank you for taking the time to read about my family’s history and this recipe that is so special to us. I hope you have a wonderful Thanksgiving celebration with your family and I’d love to hear if you decide to add our squash pie to the menu! 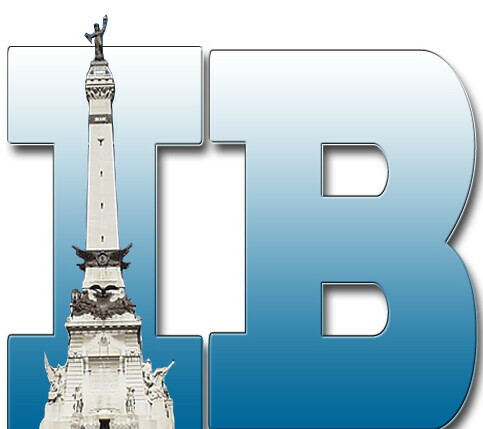 Posted on March 14, 2015, in Did You Know?, Events, My Life, Recipes and tagged Blackford Kentucky, Cushaw Squash, Cushaw Squash Pie, Derr's Vanilla Extract, Pi, Pi 3.141592653, Pi Day, pumpkin pie, Squash Pie, Thanksgiving Favorites, Thanksgiving Recipies, Veteran's Day. Bookmark the permalink. Leave a comment.